PLANS to erect a mobile phone mast in Olton have raised the ire of local people. Telecoms giant Orange hopes to install a 10 metre tall transmitter close to Dovehouse Parade. Described in the application as a “stealth mast”, the base station would have a lamp post -like appearance. Now residents have joined forces with the Liberal Democrat group to oppose the application - due to go before the planning sub committee on January 7. 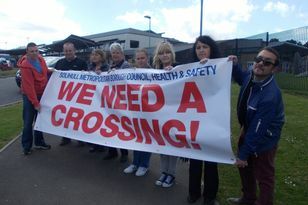 Over 180 locals have signed a petition urging members to throw out the plans. Councillor Norman Davies, leader of the Lib Dem group and an Olton councillor, said: “These mobile phone masts are unsightly and they require on-going servicing which means more maintenance vehicles in obstructive positions. In recent weeks, Solihull’s MP Lorely Burt, Coun Davies and other Lib Dem councillors have visited nearby homes asking for people’s views. It is clear that many residents remain suspicious about the possible health risks. In a health and safety report which was submitted as part of the planning application, Orange said that it recognised the concerns of the public. The company said the mast on the Warwick Road would fully comply with the requirements set down by the International Commission on Non-Ionizing Radiation Protection (ICNIRP). To view the plans in full go to www.solihull.gov.uk/planning. I WANT to pay tribute to the hard work of the local campaigners who have successfully fought off the threat to build a motorway service area. A SEA of poppies marked Remembrance Sunday and Armistice Day in Solihull as thousands gathered to pay their respects at a host of parades and services across the borough.